Female Barred Owls keep their owlets warm by brooding them for the first two weeks after hatching. The female will decrease her attendance once the chicks grow larger and become able to thermoregulate. Get a great look at the owlets in this clip when their mother leaves the nest box for a short bout of hooting with her mate. Watch live at http://allaboutbirds.org/barredowls for information, highlights, and a link to the outside view. The camera system was updated in 2013 with an Axis P3364-LVE security camera and microphone mounted to the side of the box and connected to Jim’s house via 200 feet of ethernet cable. To keep predators like raccoons from investigating the nest, aluminum flashing was wrapped around the tree. 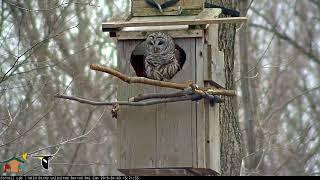 An infrared illuminator in the box means you can keep track of the owls’ comings and goings throughout the night (don’t worry—the light is invisible to the owls). Since the birds aren’t banded, we can’t tell whether this is the same pair as in past years. Although male and female Barred Owls look alike in their plumage, females can be up to a third bigger than males. You can also tell the difference between them by watching their behavior; only the female incubates the eggs and chicks, but the male is responsible for the bulk of the feeding, ferrying prey items to the incubating female, and sharing them with her inside and outside of the box. Learn more about Barred Owls in our AllAboutBirds Species Guide at https://www.allaboutbirds.org/guide/barred_owl/id.